Although a modern-looking hotel on the outside, on the inside there is a combination of traditional Albanian methods of masterful woodwork and stonemasonry. Built in 2006 and renovated in 2008, the hotel has been designed with the owner's passion for history and tradition in mind. In the bar-restaurant area, there is a 300-year-old stone fireplace, while the furniture throughout the hotel is made of solid oak. 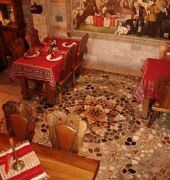 The traditional Albanian cuisine is another factor that raises the hotel's standard. 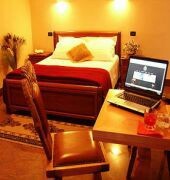 There are a total of 9 guest rooms on offer, of which 2 are twins, 2 are doubles, 1 is a triple and 2 are suites. 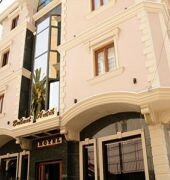 The air-conditioned hotel welcomes guests in a lobby with 24-hour reception and check-out service and a cloakroom. Internet access, room service and a car park are also available.